After the highs of the Mass Effect trilogy, being tasked with taking that universe further is a daunting order. An incredible space opera spanning three games with The Normandy’s crew isn’t something easily uncoupled from expectations into future games - or any Bioware title for that matter. Mass Effect: Andromeda's greatest challenge is surviving the series' towering legacy, and it is here that both its greatest successes and failures are found. 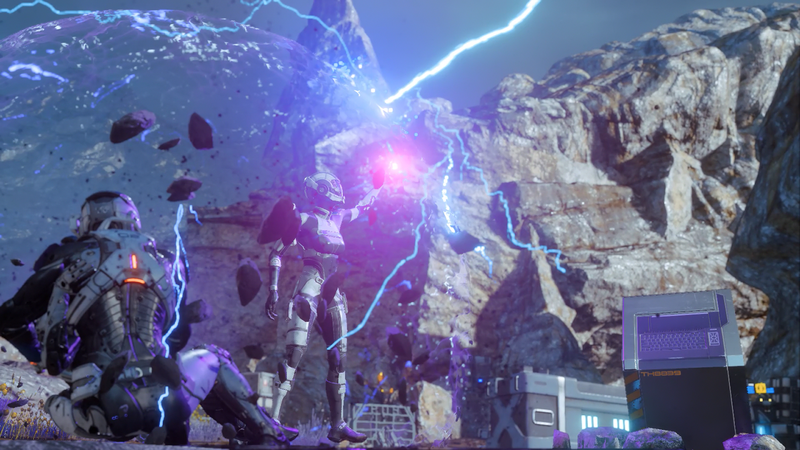 Andromeda's story, characters, environments, and sound are Mass Effect to their very core. Taking Ryder as far away from Shepard as possible gives the game the distance it needs to start somewhat fresh away from some of the minutiae of the trilogy. However, the goodwill built up by the Tempest’s crew and the journey into Andromeda is significantly damaged by struggling performance and a jarring lack of polish in places. After the week we've had, one can't ignore the elephant in the room: the facial animation. Anxiousness has been building over this since the first gameplay footage, and the final game reveals those fears to be well founded: there are too many dead-eyed expressions and stony stares in major story sequences. 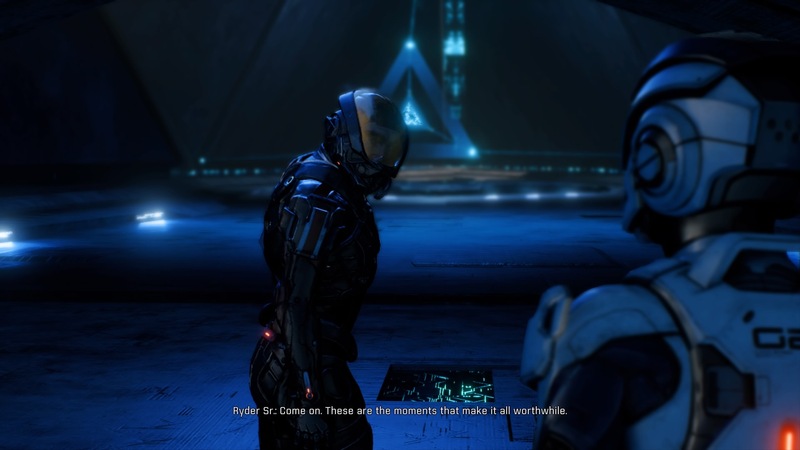 This hurts all the more when Ryder is confronted with major plot developments; spot-on voice acting sells the emotion, but the deadpan expressions do not. Fryda Wolff and Tom Taylorson put in excellent performances as Sara and Scott, but these performances are undermined often. It's not as bad as the gifs would have you believe all the time, but those problems are frequent - too frequent. 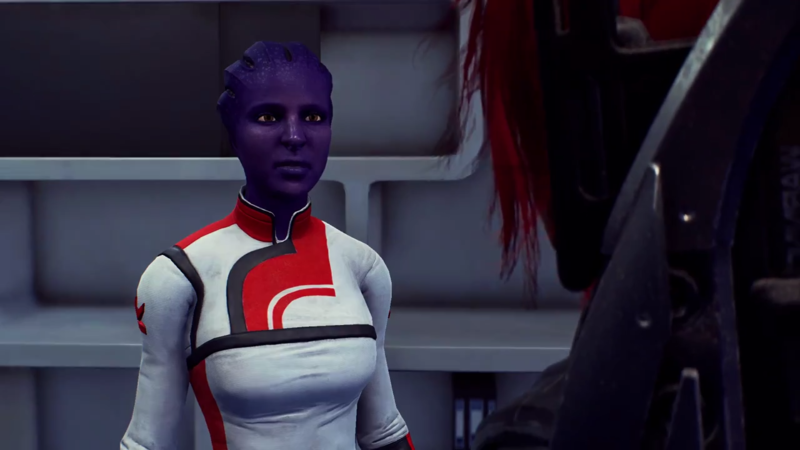 I’ve never thought animation, or polish in general for that matter to be a strength of Bioware, but the impact of the animation on Mass Effect: Andromeda's story feels particularly painful. With that being said, Andromeda is much more than these bizarre interactions - so let's get into all that. Andromeda opens on a high note. Hundreds of years divorced from the original Mass Effect, the Andromeda Initiative seeks to colonize a galaxy far from the Milky Way. Alec Ryder, humanity’s pathfinder, immediately begins his search for a hospitable world. Somewhere along the way that journey goes south and, depending upon your choice, one of Alec’s children will take up the mantle of pathfinder in their father’s stead. The intensity and tone of that first mission establishes a mood that guides and defines the game. There’s one moment in particular, where Alec Ryder stumbles upon some ancient alien technology, that felt like the game finally telling you ‘this is Mass Effect.’ However small that moment may have been, the presentation of that moment hits the high notes I expect from this series. Alec faced with this massive unknown in the form of an eerie, alien monolith stands as some of my favorite images from Andromeda. It's immediately after this strong opener that Andromeda hits choppy waters. First there are stodgy exposition drops on this game's Citadel equivalent featuring some of the most egregious animation faults. Then there's Eos: your first major story planet. Exploring Eos is initially a chore. You're introduced to the Nomad, a new vehicle that improves upon your worst Mako nightmares from the original Mass Effect, but then you're moving from one uninspired encounter to another and completing alien Sudoku. Eos is massive, but without much explanation the game kills you from radiation poisoning if you veer off the beaten path. "Just get off of the Citadel," is a good mantra for getting through the first few slow hours of the original Mass Effect. In Andromeda, that sentiment translates into "just get off of Eos." There are shades of "Leave the Hinterlands" from Dragon Age Inquisition here, too. It’s a shame, because later on when you visit the planet again, you may find Eos is quite a blast to explore - but the way it is presented early on leaves a poor impression. Once you do finally conquer your first encounter with Eos, Andromeda quickly picks up its pace by further acclimating Ryder with her crew and taking the leash off. 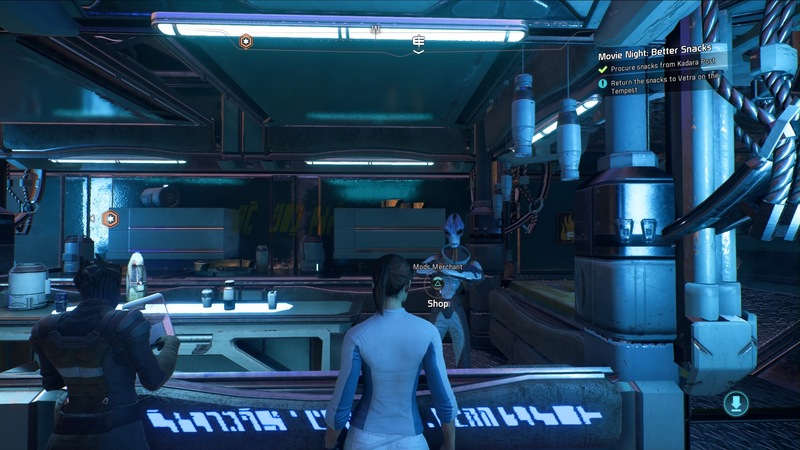 Undertaking a sidequest at this point can mean either a 30 minute exploration into something like Andromeda’s first murder, or hours of character development in the form of a loyalty mission. Here is where Mass Effect: Andromeda shines. Side content is split into a few different branches, and the main, proper side quests are meaty and feature interesting tasks to complete. As is perhaps Bioware tradition, some of the best writing is hidden away in optional quest dialogue. Lesser quests, designated 'tasks', have you repeating the same task such as mineral scanning or tracking down the corpses of colonists. It's good that this content is separated out - it makes the repetitive open world chaff easier to ignore. 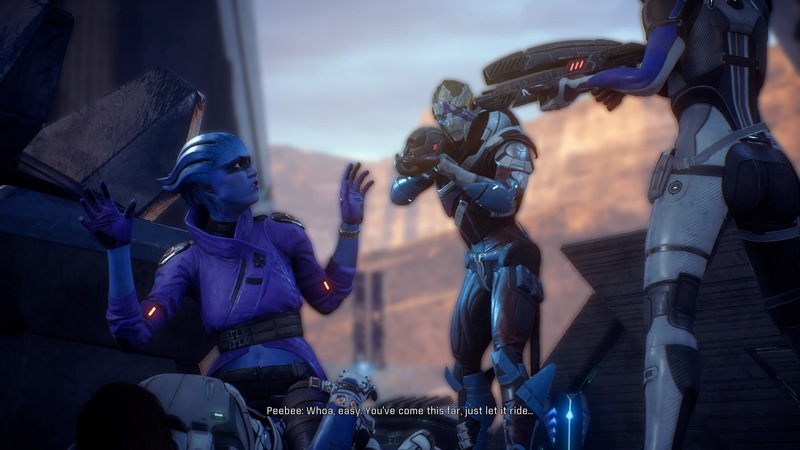 Side quests are also where you'll find the most frequent nods to the trilogy, but it avoids going so far as to having Garrus and crew beat down the door of the Tempest and take over. For fans of the trilogy, there’s a lot of small details that feel satisfying to catch. For those unfamiliar with the universe, Andromeda doesn’t need you to complete three games worth of homework. On its own, Andromeda holds up just fine. Perhaps one of my greatest fears going into Andromeda was that this just wouldn’t be the case. I’m far too attached to Shepard and crew to learn to accept a new star. Yet Ryder isn’t a recreation of the larger-than-life N7 I loved so much. In my playthrough, Sara was my twin of choice. Where Shepard was two gendered readings of one character, the Ryder twins are different. Sara is the older sister who immediately reminds everyone that she has a few seconds on little Scott. She's personable, but awkward. 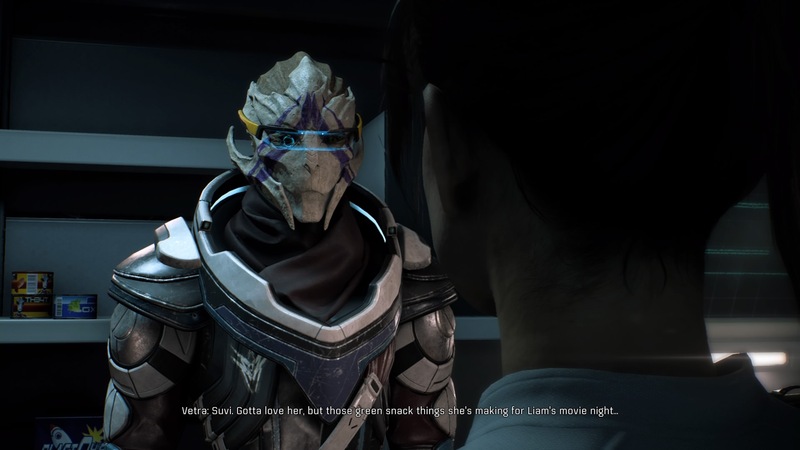 I found several of the dialogue choices I made ended with her effectively placing her foot in her mouth and trying to scramble out of it, especially when it came time to romance a certain Angara. Prying into what motivates someone into cryogenically freezing themselves for centuries and leaving their entire life behind always led to interesting conversations. Sara isn’t really ready to lead and makes no secret of it. She struggles with her father’s decision to put all of this responsibility on her, and we see that come out in conversations with crewmates. With Cora in particular, I found some of my favorite interactions featured Sara trying to understand what her place really was. These traits in Sara are not uncommon in the rest of the crew. Most of them are young, a little unsure of where they’re going and can’t quite find their footing in this new galaxy. A favorite theme in them, and just about everyone from the Milky Way, is that everyone is hurting in some way since embarking on the Andromeda Initiative. Prying into what motivates someone into cryogenically freezing themselves for centuries and leaving their entire life behind always led to interesting conversations. Dialogue, relationships, and romance have always been central to Bioware titles. Andromeda makes good on the promise that there’s more of that here than we’ve ever seen while also keeping the quality I’m familiar with. The crass and simplistic feeling that you can just 'Say "X" to bang' still feels present, but it’s at least a bit more tactfully hidden in the layers added to conversations. Interactions feel dynamic, and while I did get repeat lines frequently, I found my crew to be much more talkative than my old friends from The Normandy. It's familiar to the old games, but expanded. 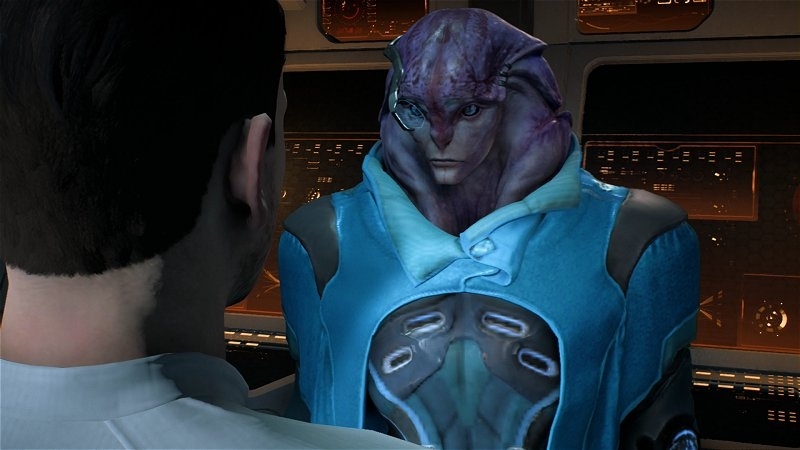 I loved your salarian pilot's exasperated plea of "kill me now" after watching Ryder’s miserable attempt at flirting. 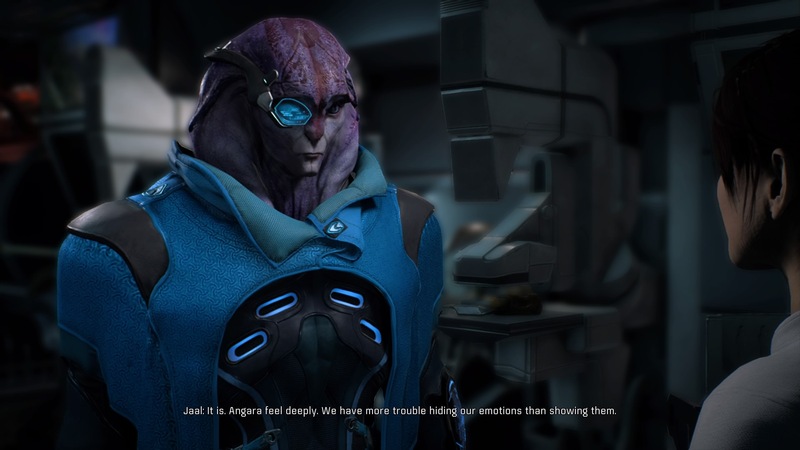 Then there was learning about crewmates like Jaal, who is overwhelmingly emotionally available due to the Angaran culture. The carefully crafted uniqueness in all of their personalities, histories, and ambitions make for a crew that can easily become iconic in their own right, quite an achievement. If there's a flaw, it's that the game perhaps leans too much on the established Milky Way races - it doesn't use the differences in Andromeda enough. There’s more in Andromeda that feels familiar but still new. Roles like Vanguard, soldier, adept, etc. all make an appearance but not in the ways seen in previous games. The pathfinder can equip any of the seven profile types for added bonuses catered to your chosen play style. 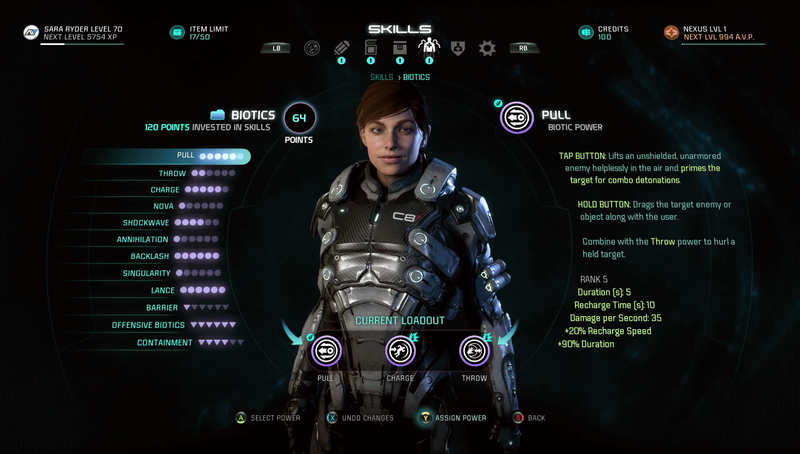 These profiles are ranked up by focusing skill points in either combat, biotics, or tech. The idea of being able to switch roles and having all skills available from the start seems smart, but in practice it falls flat from an RPG-focused perspective. Here's the problem: switching roles requires pausing. The menus are absolutely rubbish and sluggish, so you don't want to experience this mid-combat. The sheer number of skills and how they diverge is impressive and commendable, but this is damaged by the removal of the power wheel. Now you can only equip three powers at once. Rather than encourage you to experiment with myriad skills, the game instead pushes you to min/max by focusing on three active skills and then as many passive boosts as you can afford. The gunplay is the best the series has ever seen. It's amped up and fast, built on the solid foundation offered by Mass Effect 3's brilliant multiplayer. This was likely the inspiration for killing the power wheel, but removing it not only limits your skills but also entirely jettisons party member control. The game puts a heavy focus on combination attacks, but by limiting your skills and removing your ability to order allies to use their skills on specific enemies you're forced to focus on a few skills that you can combo together in a reliable way. The game offers a breadth of choice but then its design pushes you away from experimentation. This is a shame because minute-to-minute combat feels great - in fact, it's brilliant. The wide open areas you fight in are almost universally larger than in the trilogy, and the jump jets make for vastly improved movement options during combat. Ryder’s ability to propel herself around gives battlefields new dimensions they didn’t have before, and there’s nothing more satisfying than jumping down with the jump jet and sinking your omnitool into a Kett’s face - but the skill system leaves a lot to be desired. Exploration is sort of a halfway house between Dragon Age Inquisition and Mass Effect 2. 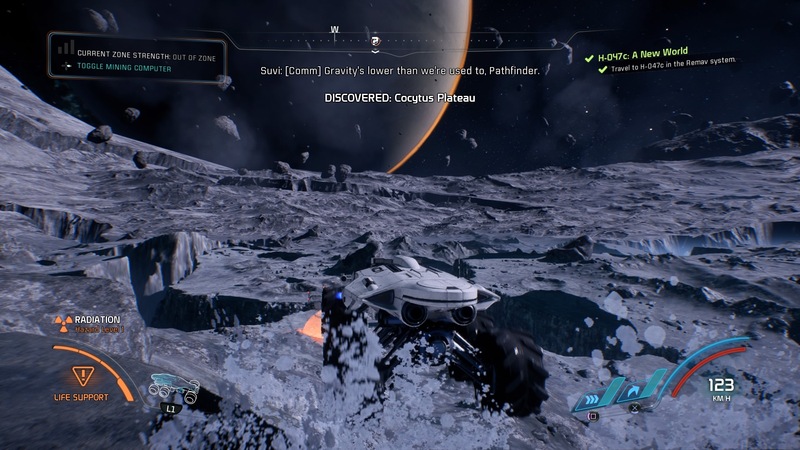 There's a light planet scanning component (I enjoyed it in the second game and will probably go down as one of the few who did), but minerals and other materials are found all over the game world. Their payout also feels more immediate, as there’s plenty of weapons, armor, and mods to research and create back on the Tempest in a much more traditional RPG feeling and enjoyably in-depth crafting system. When it comes to exploring planets, the Nomad has the Mako beat, but the bar is pretty low when talking improvements over a vehicle I spent hours driving backwards in the first Mass Effect. The Nomad is decent and improves significantly with some researchable upgrades, but I occasionally still found myself getting Mako-stuck or being propelled off in weird ways by physics. Even with these transportation nags the sights and sounds of Andromeda's large open environments are most enjoyable. Each of the environments has a unique feel, and though their wide-open state won't be for everyone, they are well designed and fun to explore. From unique flora and architecture to strange new creatures, planets in Andromeda have vastly different environments that pose a different set of challenges for that world. Radiation, heat, and cold are just a few of the factors that will shape how you explore Andromeda’s locations. Using resources collected on other planets, you can research and develop the tools needed to survive less hospitable climates. Post-Eos, the environmental factors make for more interesting tactical decisions versus being stuck somewhere with very little resources. While Andromeda is pretty to look at, sometimes exploring it is a challenge not by design. On one occasion I found myself sandwiched between walls and unable to escape. Then there were two other times in which I took damage from nearby enemies while stuck talking to an NPC. The first time, I made it out alive, but the second time I couldn’t hurry through dialogue fast enough and died to a mess of gross desert spiders. Experiencing a game over screen because I'm bad isn’t a problem, but dying to glitches is one of the more infuriating ways to go. Then there were the scripting issues such as a gigantic flying boss enemy that's supposed to fly between various positions during various stages of a fight taking flight then never coming back down, allies adopting and refusing to leave T-poses, or story sequences not triggering, thus forcing a reload. After a few rough instances I got it in my head to manually save often - though even then, you can't save mid-mission for some reason. Some of these issues appear to have been improved drastically since we began playing thanks to a patch, but they were so ever present it'd be remiss not to mention them. For all the hyperbole around rough animations online and for all the complaints I've had to raise in this review, it bears saying outright - Mass Effect: Andromeda is a good game. When you need a break from Andromeda’s main mission, there's multiplayer. It wasn't broken in Mass Effect 3 and so Bioware hasn't seen fit to fix it: this is a horde mode with RPG character progression and random card pulls for loot. Here the three-skill design of the combat makes a lot more sense as it encourages a smart team make-up and good team communication. It's something I could see myself pouring hundreds of hours into, as I did in Mass Effect 3. It needs to be repeated over and over, as with any luck most of the worst offenders to its quality such as crashes can and will hopefully be patched. The facial animations melt into the background as the story immerses you - and it'd be silly to pretend that the trilogy didn't have any of that 'Bioware jank' going on - it's just more immediately noticeable here. Perhaps this console generation shift has moved the quality goalposts further than Bioware were able to reach in this title. The back half of the game is certainly a drastic improvement on the early parts, and the way it wrapped up certainly boosted my impressions of the game. I'm particularly fond of Andromeda’s tone. It's hopeful, and feels more bright-eyed than the trilogy. Where the trilogy games each wrap up with the feeling that chapter is closed, Andromeda encourages you to return post-game and continue the adventure - because in a new galaxy, there's lots of exploring to do. Andromeda has a spirit that I don’t want to see squashed by technical failures and a few questionable design decisions. 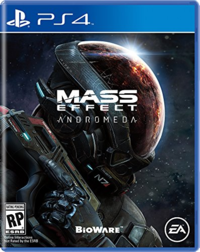 Andromeda is ambitious and above all else it has heart - the deeper I got into the game, the more glued to it I became. Had it been anything less I would’ve sat my controller down and given up, but the journey most certainly made the struggle worth it. Ryder’s tale feels like a solid beginning to something new. It needs more than a little polish, and probably some extensive work under the hood, but Andromeda has reassured me Mass Effect can exist without the Citadel, Earth, Shepard or even Ryder. This new galaxy left me with more questions than answers, but I’m okay with that. I hope another entry to the series means more exploration into every corner of humanity’s new home. So when does Mass Effect: Andromeda take place?